Angular 6 allows to Lazy load modules when they are required, they are not loaded at once on application initialization. To implement Lazy loading in Angular 6 we will use the main Routing module which will import all components we want to lazy load. Before creating Angular 6 you should already have NodeJS installed. we need to import the Router Module in the main application module. We can safly remove component imports and declarations from app.module.ts, as each view is already having thier own module defined. As you can see here instead of forRoot we called forChild as these are child modules which will be called in app’s main routing module in step 5. 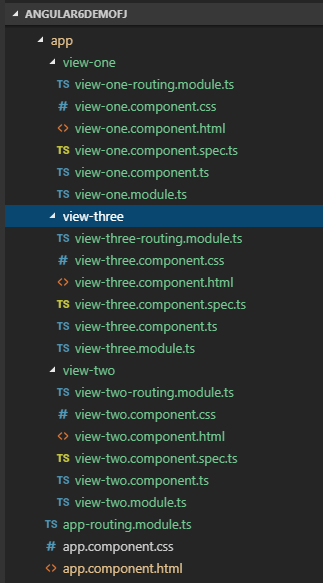 Now in main app-routing.module.ts add below code. Here we will define child modules in loadChildren attribute having a Hash # defining each independent module’s name. in the debugger, components are loaded after we click on the View link, they are not loaded on application initialization or app start. Lazy loading may prove helpful when the application grows and have a number of components, this design makes application loading fast.